Widespread and locally common in suitable sites. Adults can be seen between mid June and September. 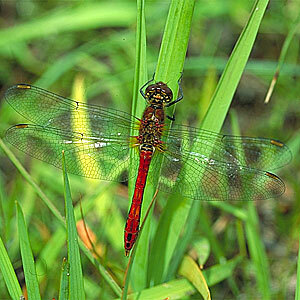 The Ruddy Darter is found in fens, cutover bogs and small lakes including turloughs. There is some evidence for immigration. This species is most likely to be confused with the Red-veined Darter Sympetrum fonscolombei and the Common Darter Sympetrum striolatum however the latter is more orange-red and has a straight sided abdomen and yellow stripes on the legs. Female Ruddy Darters are similar to female Black Darters Sympetrum danae however in the former there is no black triangular marking on the thorax.